Join the Green Living Community! Subscribe for green eating + living guides! Vegan Zuppa di Farro, a simple soup made with farro, borlotti beans, crushed tomatoes, vegetables, and fresh herbs. A plant-based twist on the traditional Italian soup! Do you love farro? Being married to an Italian means farro finds its way into many of the foods we prepare, as evidenced by this simple Black Bean Corn Farro Salad and this Easy Lentil Bowl with Spicy Harissa. But farro is also a great grain for soups because the small wheat kernel soaks up the flavors of the soup and lends a nice nuttiness and chewy texture. 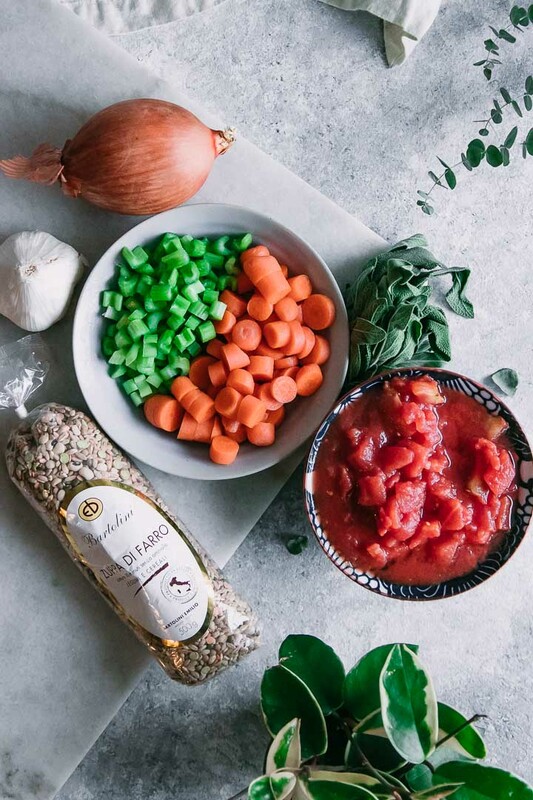 And one of the Italian’s simple peasant dishes is zuppa di farro (which translates literally to farro soup), a simple farro and bean soup with tomatoes, vegetables, and herbs. 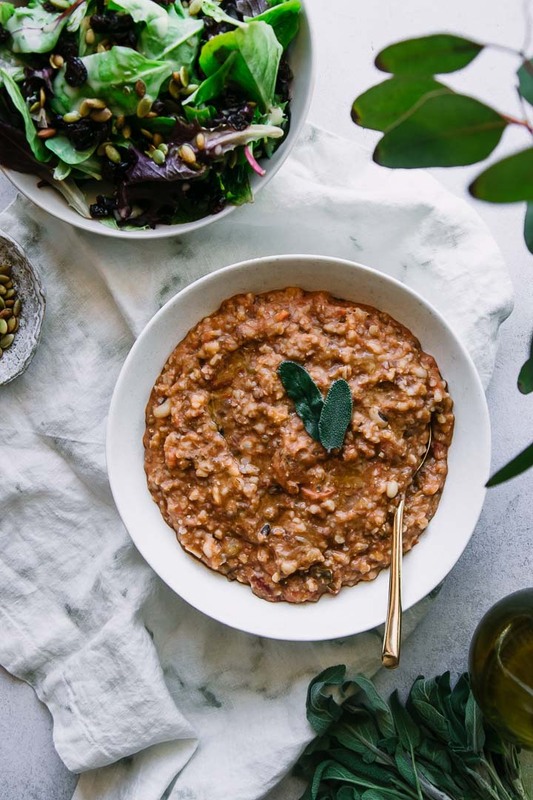 Typically zuppa di farro is made with pancetta and is topped with a bit of cheese, but we wanted to keep things plant-based so we made sure to kick up the flavor with a blend of both thyme and sage and topped it off with a bit of garlic-infused oil. And the result was a flavorful, thick, and hearty soup that’s a perfect cozy comfort food. Want the simple one-pot Vegan Zuppa di Farro recipe? Let’s do it! Some Italian specialty stores sell premixed farro and dried beans, but this recipe shows you how to make it from scratch. First, heat a drizzle of olive oil over medium heat in a large soup pot or dutch oven. Add chopped onions, carrots, and celery and cook until soft, about five minutes. Next, add borlotti beans (sometimes referred to as cranberry beans), farro, crushed tomatoes, and vegetable stock. Then add bay leaves, a bit of thyme and sage, and a pinch of salt and pepper. Mix together and bring soup to a boil, then reduce the heat to simmer for 40 minutes. To serve, add a few sage leaves and a drizzle of garlic-infused oil (optional) and enjoy! Mix up the herbs: I studied many different zuppa di farro recipes and each used different herbs, from thyme to sage to rosemary and oregano. Use what you have on hand, it’s sure to be delicious! Love this simple vegan farro and bean soup recipe? Check out our other plant-based soup recipes, like this Red Beet Apple Soup or Spicy Butternut Squash Chili. 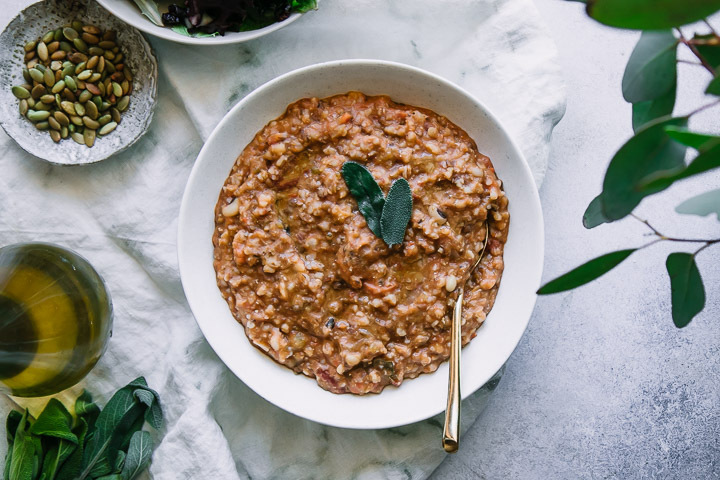 Did you make this Vegan Zuppa di Farro? Leave a comment below and rate the recipe to let us know how it turned out. Save this simple soup recipe for later by pinning to your favorite winter Pinterest board and make sure to tag me on Fork in the Road’s Instagram to show me your soup creations! 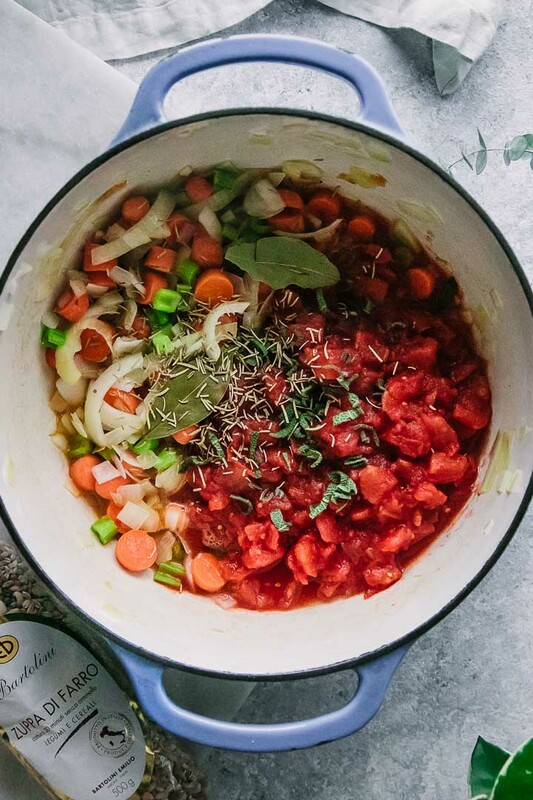 In a large soup pot or dutch oven over medium heat, add olive oil, onion, carrots, and celery and cook until vegetables are soft, about 5 minutes. When vegetables are soft add beans, farro, crushed tomatoes, vegetable stock, bay leaves, thyme, sage, and a pinch of salt and pepper to the pot. Mix well and turn up heat to bring soup to a boil, then reduce heat to medium-low and let simmer for 40 minutes. After soup is done cooking, use an immersion blender to puree about half of soup mixture. Soup should be halfway blended and slightly thickened, but still a soupy liquid text. 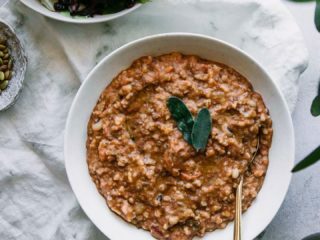 Notes: instead of buying beans and farro separately, you can also purchase a dried zuppa di farro blend made of farro, beans, and sometimes other grains and peas. If so, you may need a bit more vegetable stock and will likely need to add about 10 minutes to the total cook time to ensure that beans are cooked throughout. Nutrition notes: nutrition information calculated for one serving, without optional garlic oil drizzle. This recipe is a vegan soup that is high in plant-based protein, fiber, and vitamin A. This post may contain affiliate links. Please see our Disclosure policy for more info. I'm a dietitian who believes food should be good for you AND good for the planet. Join me! Be the first to know about new seasonal recipes and green living resources. Want to go green but not sure where to start? Join the Green Living Community for recipes, green living guides + a FREE weekly meal planning guide!